"CAPM Unit Fund" is the first time ever digitized open-end mutual fund in Bangladesh designed to provide capital appreciation benefits with regular dividend income opportunities. The fund is characterized with perpetual life and unlimited size due to the instinctive individuality of the open-ended funds. It is a self sponsored and managed Mutual Fund in Bangladesh has been formed with the objective of long term capital appreciation with regular dividend income by investing in a diversified portfolio predominantly consisting of equity and debt related securities of the Bangladesh Capital Market. The second objective is to outperform Bangladesh price inflation in the long run. The total asset pooled in the CAPM Unit Fund will be allocated maintaining the rules and regulations prescribed in the Bangladesh Securities and Exchange Commission (Mutual Fund) Rules, 2001. Regular Dividend income opportunity with continual capital appreciation benefits. Acceptance of cash dividend and/or reinvestment of dividend (CIP) are allowed. Opportunity to enjoy the benefits of reserved Quota of 15% in all IPOs. 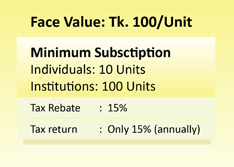 15% Tax rebate benefit over investment value upto Tk. 1.5 Crore or 30% of total income whichever is lower. Dividend income are tax exempted upto Tk. 25,000/- under Income Tax Ordinance 1984. SMS alerts after transaction confirmation. Online and/or SMS based balance inquiry. Free from operational hazards; saves transactions/ operational costs. Experienced Professional managers to manage the investment of the Fund. Funds are managed professionally; eliminate emotional stress of day to day management. Traded close to NAV (avoid market malpractices in pricing). CAPM Unit Fund is initiated keeping investors every benefit in mind. The fund will make your investing experience in the capital market products of Bangladesh conveniently peaceful. Automated (online based) investing processes will make investors investing process to the fund convenient, safe and hassle-free. 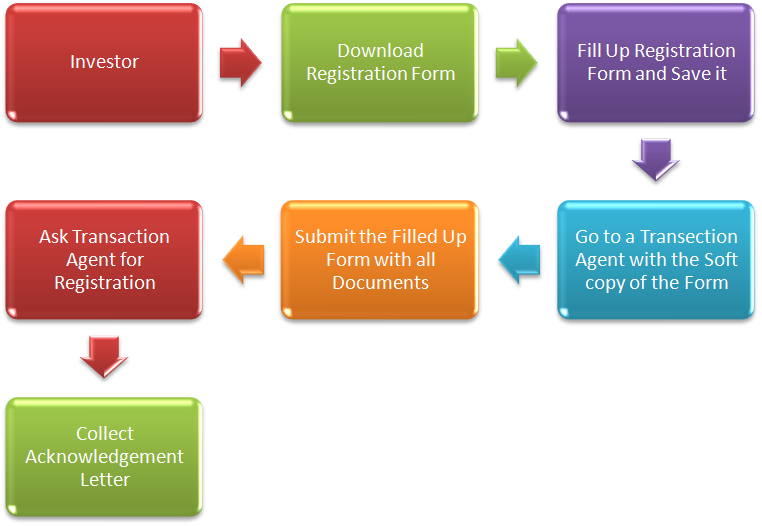 Step 2: Fill the Registration form with valid information and save it as a soft copy. Step 3: Bring this file to the Transaction Agent with all other necessary documents. Necessary document for Registration. Step 4: Ask the Transaction Agent to proceed. Step 1: Directly go to the nearest Transaction Agent (TA) with necessary documents. Step 2: Submit the documents to the Transaction Agent. Step 3: TA will complete your registration process and provide you an acknowledgement where you will get a unique registration ID. Also a copy of acknowledgment will be sent to your e-mail ID, which has been provided by you during registration. Step 4: After getting this registration ID you will be ready to subscribe our open-end mutual funds. 1.To get the E-mail service investor must have a valid e-mail account. 2. Open a mobile bank account with Trust Bank Limited. Step 1: Directly go to the nearest Transaction Agent (TA) and inform TA about your intention of buying/subscribing the fund. Step 2: Tell the TA about your investor’s registration ID, how many units you want to subscribe and also the necessary fund payment mode*. Electronic Transfer: Advice your bank to transfer amounts from your bank account to CAPM client account. Mobile Banking: Transfer required amount from your mobile bank account to CAPM mobile bank account. Step 3: TA will complete your subscription process and will provide you a payment advice. Also a copy of payment advice is sending to your e-mail address. Note:1. Your subscribed units will be under pending status, until or unless your payment is received by the Asset Manager to the respective bank account (Bank Details). As soon as your payment is received the pending units will be delivered against your Investor ID. Note:2. The transactions will be processed as per the Net Asset Value (NAV) per unit as on the date and time of receiving the request. 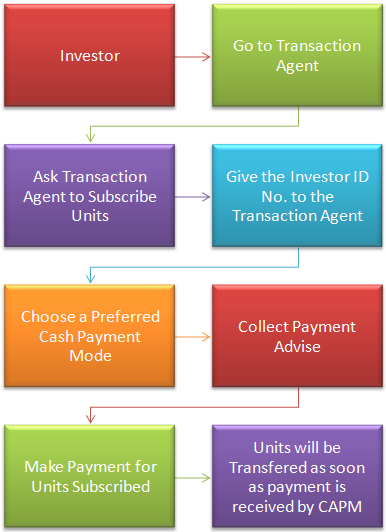 Step 1: Go to the Transaction Agent (TA) and Provide investor’s registration ID, and tell TA how many units you want to surrender (from investor holding unit) and also preferable cash receivable mode. Electronic Transfer: CAPM will transfer your surrender amount to your bank account (mentioned at the time of registration). Mobile Banking: If your surrender amount is equal or less than BDT 5000.00 CAPM will send it to your mobile bank account. Step 2: TA will complete your surrender process and system generated surrender acknowledgement report will be sent to your e-mail address. Note: The transactions will be processed as per the Net Asset Value (NAV) per unit as on the date and time of receiving the request. 1. Carefully read fund documents before investing. 2. Mutual fund investments are subject to market risk..
3. Forecasted financials doesn’t represent the actual performance. 4. Past performance is not necessarily a guide to the future.